I dread trying to change the straps on my better watches that have bracelets, as it seems fraught with scratchy-scratchy danger and I like to take care of my things. For this reason, I have a couple of watches which I never wear on anything but the bracelet - but then I get worried that the bracelet may get scratched through use, and have major FOMO when I see how great those watches can look on straps. My life is so difficult!! I've known spring bar pliers are the tool for the job for these precision-fitting end links, but the price of the well known Swiss ones I sadly can't justify, and my partner would have a fit if I said I wanted a set for my birthday. Hence I've been casually looking for a more cost effective option. Recently I thought I'd search and see if China had successfully cloned this tool and sure enough, they had started popping up on eBay (maybe they were there all along, but I'm sure I'd checked a month or so ago). At £27.54 delivered I thought they were worth a punt, and after a week's wait they arrived. In the set you get the main body of the tool, which seems to be anodized aluminium with steel fittings/other parts. There are a total of 8 double-ended tips, i.e. 4 matched pairs, with various sizes from tiny to huge, and one pair having thin round pins rather than the usual recessed ends which I am sure are useful for something. The tips come in a little brittle plastic vial held together with tape - nothing but the best, the Swiss can only aspire to be such good engineers. The tips can be installed to point straight out at the front, or at 45 degrees in either direction, and they are held perfectly secured by the knurled whatnot type arrangement. There is a screw which sets the limits for the pliers to accommodate different ranges for different sizes of spring bars, and as you can see in the photo I've used this to compress and hold a Seiko fat spring bar without popping out. I've not handled the Swiss version so cannot compare quality, I can only say that using these spring bar pliers has been reliable and effective in my use so far. The tool feels well made (at this price, for something from China, you're usually getting upper-end for Chinese quality), and I think they exceed my expectations and will last well. The only minor negative is that the tips themselves are a little inconsistent between the pairs (i.e. the cut-out recess is very slightly different in size) - not that this affects anything in use, it is only visually obvious they are not perfectly identical. 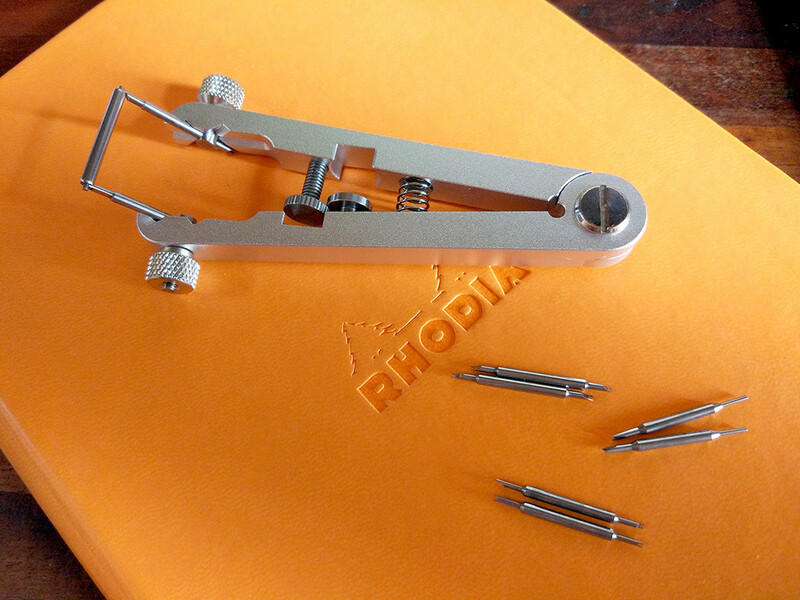 I expect this tool would fit the proper Swiss tips if you wanted to really treat yourself in future though, but for me at my "watch user" level, these are ideal. I have no affiliation with China or any particular seller. There are many on eBay which appear to be the identical product and they are also available on Aliexpress (100% reliable in my experience). I went with the cheapest seller who claimed to be in the UK. They seemed to come via a Gizmo-outlets/Creation Watches type route where they ship from overseas, but arrive by Royal Mail Tracked 48 with no customs fee to pay. Just thought these might be of interest to others in my terrible first world predicament. Now I'm stocking up on those oh-so-sweet Shell Cordovan and Russian leather straps for my Sinns with impunity! Thanks for the review. I've long been tempted by the real thing but put off by the price. I think that I'll try the Chinese version to see how much I like the tool. Question...have you found anywhere to source replacement tips...or 'needles' as the Chinese call them, please? nice can you supply the link where you got yours? I haven't looked, but my experience in the past with Chinese spares is either ask when you are buying them as the seller often deals directly with the factory, or buy a whole new set in the future. Just seen this and ordered a set. Something I’ve never bothered buying on the basis that they’re not essential, I’ve allocated money to buying tools I really need in the past, but they’ll sure make life easier! Just noticed this as well and ordered, thanks for the link. Another thanks for the link. just ordered. Mine arrived today, just tried them out on a Rolex explorer bracelet that's not easy to get off owing to the very snug fit of the end pieces. First problem with the tool was getting the points to fit. One of the holes wasn`t big enough to allow the point to slide in to the fatter part and thus locate it properly. An easy fix for me, a few strokes with a smoothing broach took the traces off roughness off the hole and allowed the point to slide in easily. Not a big problem, but it reflects the limited quality of tools in this price range and without having a smoothing broach handy I would've struggled. Otherwise, the tool was OK but I`ll only use it on more difficult bracelets, by the time I`ve messed around getting it out and setting it up I can have a bracelet on or off using my trusty single-ended Bergeon tool plus a bit of sticky tape to protect the back of the lugs. I also use a piece of pegwood sharpened to a screwdriver shape or even a thumb-nail to ease the springbars in. It's only on the very tight ones that both ends need compressing together and that's where this tool scores. I couldn`t justify spending on a Bergeon version, I`m happy with this and despite the minor issue with the hole I`m happy. I've just seen this thread, I've used one of these for a while now and the biggest issue is the strength of the tips. Use them on anything that's a bit tight or seized and the tips will snap, other than that a decent enough tool. It sounds like the Chinese tool used with genuine Bergeon spare tips could be a good compromise between quality and value for money, I assume they will be the same diameter!